The Plain Steel Rampant Lion Shield, by Marto of Toledo Spain, is an ornamental triangular shield, known as a kite shield, made from steel and embellished with gold-plated rivets. 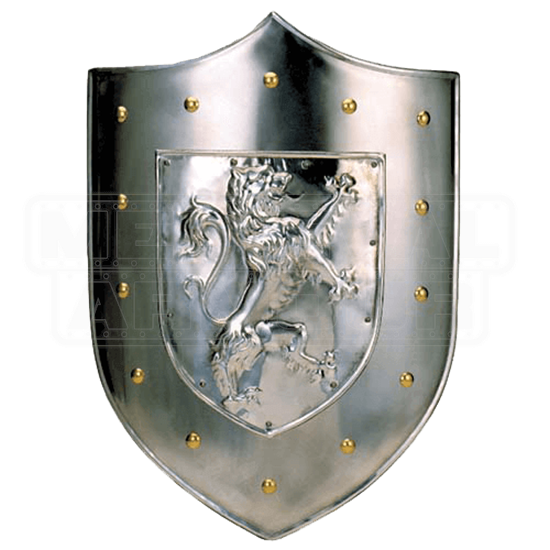 Pointed at the upper part, this shield possesses a natural metallic finish that does not diminish its beauty. Instead, it merely makes the shield appear both functional and beautiful. At the shields center is a metal sheet depicting a rampant lion, a common symbol in heraldry, which typically represents not only bravery, valour, and strength, but also royalty. This image is produced in a relief, with rivets securing the plate to the shield. The shields edges are embellished with gold-plated rivets. 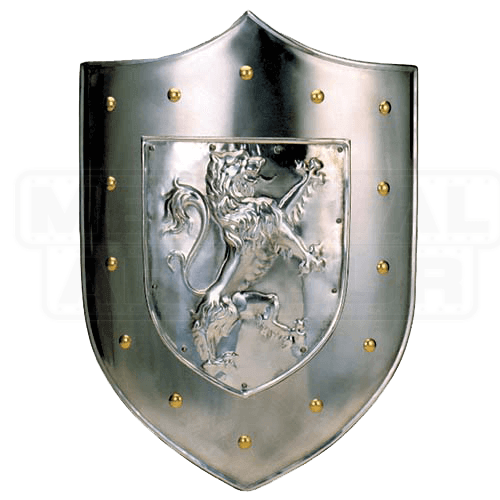 A warriors shield and a knights shield, the Plain Steel Rampant Lion Shield, by Marto, is a one-of-a-kind piece that is as eye-catching as it is appealing.